Calling all youth! 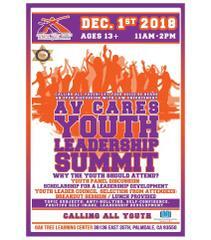 AV Cares Youth Leadership Summit is having an open discussion event that will allow youths between the ages of 13-19 to sit down with law enforcement and discuss various important topics. Topics such as bullying, self image, self esteem, leadership, and legal inquiries. See the posted flyer for additional information. Looking forward to seeing you there!